Dante Alighieri (ca. 1265-1321) is perhaps the most famous Italian poet ever. He is best known for his Divina Commedia (Divine Comedy), which consists of three parts: Hell (or Inferno), Purgatory and Paradise. Although Dante was born and raised in Florence and can be considered one of the most important Florentines in history, he had to spend the last nineteen years of his life in exile. That is why his final resting place is not in Florence, but some 100 kilometres further to the northeast, in Ravenna. Now that I have mentioned Dante several times on this website (here, here and here), it is about time I discussed his tomb in Ravenna. Thirteenth and fourteenth century Italy was torn by a seemingly endless conflict between the Guelfs on the one hand and the Ghibellines on the other. I do not think it is useful to analyse this conflict in detail here, so I will just confine myself to the most essential aspects. The Guelfs basically supported the Pope, while the Ghibellines supported the Holy Roman emperor. In Florence, there were supporters of both the Guelf and of the Ghibelline parties. Each faction had its own headquarters, its own army and its own political structure. The Guelfs dominated the city until 1260, when Florence suffered an ignominious defeat against Siena on the battlefield. After this so-called Battle of Montaperti, the Ghibelline faction took control of Florence, only to lose it again some six years later. When a Guelf Florence and its ally Charles of Anjou defeated Siena at the Battle of Colle Val d’Elsa in 1269, the Florentine Guelfs consolidated their hold on the city, never to lose it again. As happens so often in history, once a common enemy has been defeated, former allies start fighting each other. After their victory over the Ghibellines, the Florentine Guelfs split into two new factions, the Neri (‘Blacks’) and the Bianchi (‘Whites’). Dante was a member of the Whites and happened to find himself on the losing side. The Blacks got support from Pope Bonifatius VIII (1294-1303) and managed to bring down the Whites in 1301. The White leaders were punished and Dante was exiled in 1302. The poet wandered through Italy for many years, staying in many places, for instance Verona and – presumably – Lucca. 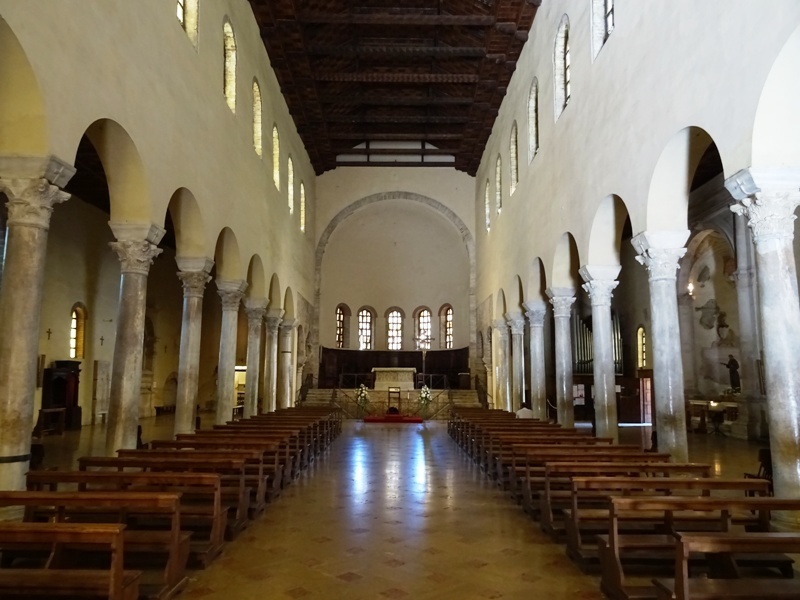 He finally settled in Ravenna in 1318, where he finished his Divine Comedy. Dante Alighieri died in 1321 after a mission to Venice and was buried in Ravenna. 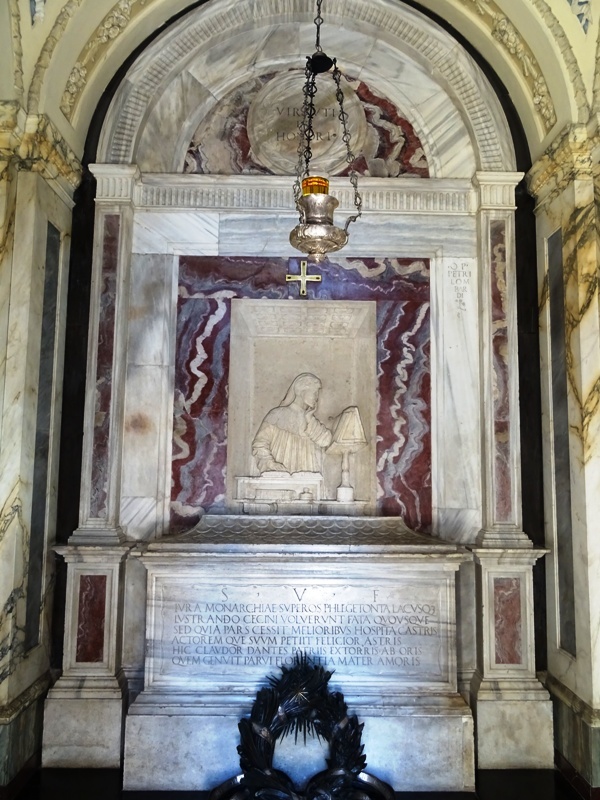 His tomb can be found next to the San Francesco church. The Basilica di San Francesco can be found to the south of the central Piazza del Popolo. The church is old, very old, but preciously little of its Late Antique shape and appearance remains today. 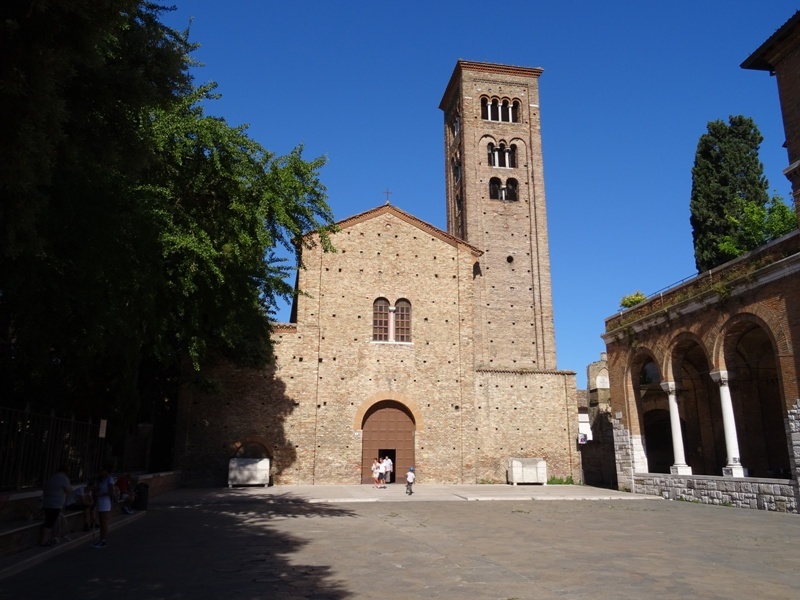 The basilica was presumably founded before or during the reign of bishop Neon (450-473), who is best known for rebuilding and redecorating the Orthodox Baptistery in Ravenna. It was formerly known as the Basilica Apostolorum, the church of the apostles, and dedicated to the saints Peter and Paul. The church was completely rebuilt in the tenth or eleventh century and renamed the San Pietro Maggiore. It was given to the Franciscans in 1261, which accounts for its current name. A radical reconstruction programme in the eighteenth century gave the church its present exterior appearance. Simple interior of the church. The San Francesco is certainly not the most interesting church in Ravenna. Its facade is made of plain brick and there is no decoration at all. Both the facade and the square medieval tower look functional and robust. The interior of the church is also very simple. There used to be many Baroque decorations inside, but these were all removed between 1918 and 1921. The most interesting elements still present are probably the columns and impost blocks, which date back to the middle of the fifth century and may therefore have been part of the original basilica. The columns are made of Proconnesian marble, imported from an island in the Sea of Marmara near Constantinople. In the aisles of the church, one can find several sarcophagi, one of them an early Christian sarcophagus that was reused for a member of the Da Polenta family. This family dominated political life in Ravenna between 1275 and 1440. It was a member of the Da Polentas, Guido da Polenta, who invited Dante to come to Ravenna in 1318. The present Tomba di Dante can be found to the left of the church. It is basically an eighteenth century neoclassical temple, commissioned by cardinal Luigi Valenti Gonzaga (1725-1808) and built by the architect Camillo Morigia (1743-1795). Work on the tomb started in 1780 and was completed two years later. The text above the entrance reads DANTIS POETAE SEPVLCRVM, “the tomb of the poet Dante”. Inside are an ancient Roman sarcophagus and a relief sculpted by the artist Pietro Lombardo (ca. 1435-1515). The relief features a pensive Dante, standing behind a lectern (see the image above). Dante’s sarcophagus was originally placed outside the Braccioforte cloister adjacent to the San Francesco church. 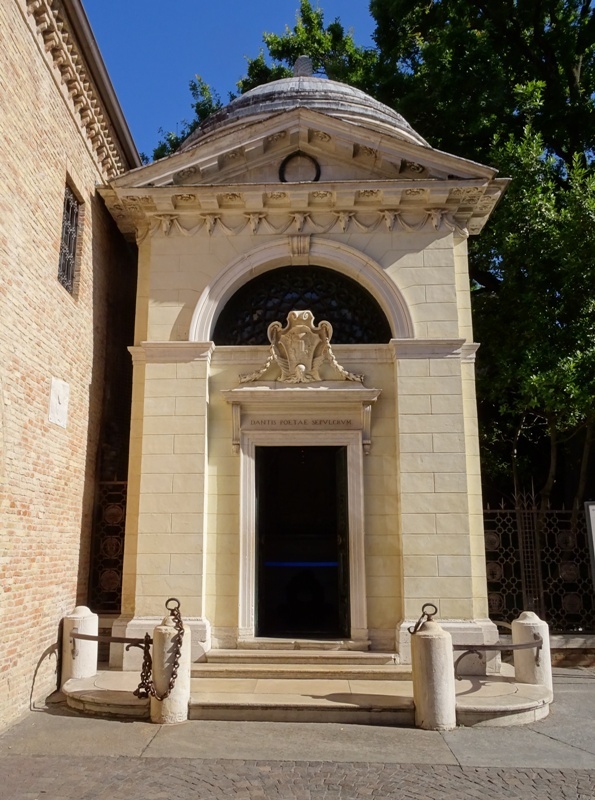 In the fifteenth century, the Venetian Podestà of Ravenna, Bernardo Bembo (1433-1519), moved it to the west side of the cloister and commissioned the aforementioned Pietro Lombardo to construct a small chapel (later to be replaced by Morigia’s creation). When the Florentines claimed Dante’s remains in the sixteenth century, the Franciscans took his bones from the sarcophagus and hid them. They were hidden again in 1810, when the religious orders were suppressed by the French under Napoleon. Dante’s remains were not rediscovered until 1865. Only then could they be placed inside the Tomba di Dante again, where they have been ever since (the bones were, however, briefly buried elsewhere during World War II, for fear of Allied bombardments).